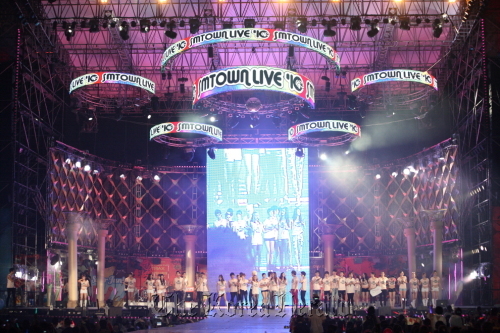 SM Entertainment said on Wednesday it will hold an additional K-pop concert “SM Town Live World Tour in Paris” on June 11, after hundreds of French K-pop fans rallied in Paris calling for an extra concert last week. Their demonstration came after tickets for a June 10 concert, to be held at Le Zenith de Paris, sold out in just 15 minutes. The protests involved a flash mob and a group dance to Korean pop music. The ticket purchase for the June 11 show will be available on May 16 at the online ticket sales site, www.livenation.fr and www.fnacspectacles.com, SM Entertainment said. Tickets cost from 45 euro ($65) to 200 euro and the concert venue can accommodate up to 7,000 seats, according to the agency. At the Paris concert, top idols including TVXQ, Super Junior, Girls’ Generation, SHINee and f(x) will be on stage, keeping the momentum of the Korean Wave in Europe, the agency said. The “SM Town Live World Tour” has been held in Seoul, Los Angeles, Tokyo and Shanghai. On Sept. 3-4, it will be held in Tokyo.